You know this thing about Shake It Up Games? Cute-games.com wants to presents our new beautiful games named Shake It Up games where, you`ll meet the characters from the series with the same name and along with them you`ll go on a wonderful world. In Shake It Up Games you can find 9 games that we've published for these kids and childrens that are interested to play Shake It Up Games, this game gategory have been created on 31.03.2016. These games with Shake It Up Games have been voted 1 times and the avarage of vote is 5.00 stars. We advice you to play the last flash game from Shake It Up Games, Shake It Up Dress Up that have been published on 01.01.2017 07:02. Shake It Up Dress Up its a part of Shake It Up Games category and until now its played 778 times. Try it now on Cute-Games.com! If your like the Shake It Up Dress Up game you can write a comment in the game page. Recommend this game to your friends if you like it! 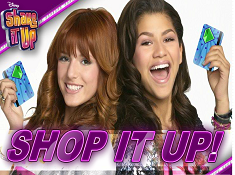 Shop It Up its a part of Shake It Up Games category and until now its played 3379 times. Try it now on Cute-Games.com! If your like the Shop It Up game you can write a comment in the game page. Recommend this game to your friends if you like it! Zendaya And Bella BFF its a part of Shake It Up Games category and until now its played 1059 times. Try it now on Cute-Games.com! If your like the Zendaya And Bella BFF game you can write a comment in the game page. Recommend this game to your friends if you like it! Shake It Up Memory Match its a part of Shake It Up Games category and until now its played 1312 times. Try it now on Cute-Games.com! If your like the Shake It Up Memory Match game you can write a comment in the game page. Recommend this game to your friends if you like it! Shake It Up Hidden Numbers its a part of Shake It Up Games category and until now its played 954 times. Try it now on Cute-Games.com! If your like the Shake It Up Hidden Numbers game you can write a comment in the game page. Recommend this game to your friends if you like it! Shake It Up Make Over its a part of Shake It Up Games category and until now its played 1315 times. Try it now on Cute-Games.com! 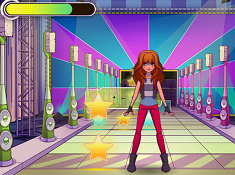 If your like the Shake It Up Make Over game you can write a comment in the game page. Recommend this game to your friends if you like it! Shake It Up Spotlight Dash its a part of Shake It Up Games category and until now its played 1819 times. Try it now on Cute-Games.com! If your like the Shake It Up Spotlight Dash game you can write a comment in the game page. Recommend this game to your friends if you like it! 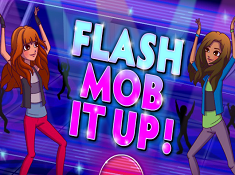 Flash Mob It Up its a part of Shake It Up Games category and until now its played 1866 times. Try it now on Cute-Games.com! If your like the Flash Mob It Up game you can write a comment in the game page. Recommend this game to your friends if you like it! Side Steppin its a part of Shake It Up Games category and until now its played 2314 times. Try it now on Cute-Games.com! If your like the Side Steppin game you can write a comment in the game page. Recommend this game to your friends if you like it! Find More About Shake It Up Games! Cute-games.com wants to presents our new beautiful games named Shake It Up games where, you`ll meet the characters from the series with the same name and along with them you`ll go on a wonderful world. „Shake It Up” is an American series produced by Disney Channel and shows the story of two talented girls who loves to dance and also, their teenagers lifes in which happens a lot of new things. The two girls were helped by a friend of them to enter into the emission called „Shake It Up, Chicago!” where, they have the chance to be and to dance with professional dancers and also they become two little stars in their college and town. One of them is Cecelia Jones but everybody knows her like CeCe, she loves dancing and she has a great talent of doing that reason for why she was chosed to dance in the emission. At school and in her private life she is a rebelious girl, very impulsive and she is always getting into troubles but being a smart girl she knows how to fix it and she pass the problems. Cece lives with her mother and her brother because her parents has divorced and she cares a lot of her family, especially of her little brother but when she has to take care of him she always ends with troubles. The other main character is Rocky Blue, another talented dancer and Cece`s best friend along with who she`s dancing in „Shake It Up, Chicago!” and they also are colleagues at school. Rocky has also a passion for animals so, she is fighting for the animals rights, she is vegetarian and a very good friend because she is always helping Cece when she has troubles even if she is a girl who don`t like to get in troubles. She is living with her family with which she has a great relationship and especially with her mother who is the second best friend of her and with who she can talk about everything. Between them you`ll meet many more characters like Flynn Jones who is Cece`s young brother and a boy who loves to play video games, to eat and to disturb his sister by making her different jokes. Another character is Ty Blue who is Rocky`s older brother, an actor and also the host of „Shake It Up, Chicago!”, he is a cool boy with a great style who always is trying to impress the girls. Deuce Martinez, is another character of the series, he is a good friend with Cece and Rocky and the one who helped them to get into the emission but he is also a close friend with Ty along with who is always ending to be a babysitter for Flynn. Other characters are Gunther and Tinka Hessenheffer, they are brother and sister but they are twin so, you`ll see them always together and also, you`ll see them dancing. Because they also have this passion for dance, they are a kind of enemies with Cece and Rocky and in the emission they are always beating to prove that one is better than the other. Now, that you know what is about in that story, you can play our free Shake It Up games where, you`ll be able to see the story closer and to be part of it. Now it`s your chance to learn dancing like the two talented girls and also you are able to spend a lot of time with them full of dance, music, fun and amazing adventures. Cute-games.com tryies to bring games for everyone so, we invite you all to play as many games as you can because each of them is different and each of them shows you different characters and things. Like always, you can play these games even if you are a boy, a girl or a kid because we have games for each of you, the only thing that you have to do is to chose a game and to play it. If you are a girl, you can play games like Shake It Up dress up games, Shake It Up makeover games, Shake It Up cooking games, Shake It Up dancing games and many other games for girls which will give you a great time. Now, if you are a boy you can chose to play our Shake It Up games where you`ll meet the boys from the series and along with them you`ll have to make many things and works together. Also, for kids we have many other games where they can have a lot of fun and also they can learn many interesting and new things. If you want to be able to see what other surprises and games we had prepared for you, you have to stay tuned on our site but, until then if you want some Shake It Up games that we haven`t published, you can tell us what games do you want and we will publish them immediately.